It has, to say the least, been a rough few years for New Jersey Transit. Over the past year and a half, the current agency leadership has overseen a disastrous response to Hurricane Sandy and, more recently, garnered bad press when football fans had to wait for up to three hours outside of Met Life Stadium when the Super Bowl ended. These were both avoidable problems, but no one seemed to care. It was surprising that no one in the upper echelons of management got the axe following the hurricane, but it seems as though the Super Bowl fallout will cause some heads to roll. As Karen Rouse of The Record reported this past weekend, it appears as though enough is enough for New Jersey Transit. James Weinstein is ostensibly on the way out as the Executive Director of NJ Transit. As Rouse notes, Weinstein has been a loyal confidant of Gov. Chris Christie’s. He took on the burden of negotiating the cancellation of the ARC Tunnel and negotiated with the feds in coming to terms on a refund for federal funds. Weinstein now appears to be on his way out. His faithfulness may not have been enough to overcome a series of high-profile failures that occurred under his watch, most notably, the agency’s ill-fated decision to abandon nearly 400 railcars and locomotives in flood-prone rail yards during Superstorm Sandy and its clumsy handling of Super Bowl transportation. Thousands of football fans were stranded at MetLife Stadium for hours because NJ Transit was unprepared for the 33,000 football fans that overwhelmed the system. He is expected to be replaced by Veronique “Ronnie” Hakim, a former senior vice president at the New York Metropolitan Transportation Authority’s capital construction program who is currently executive director at the New Jersey Turnpike Authority. His pending departure comes amid growing dissatisfaction among NJ Transit employees, who complain of low morale and favoritism in the upper ranks; tensions with Transportation Commissioner Jim Simpson, who, as chairman of NJ Transit’s board, is Weinstein’s boss; and a commuter rail and bus system so plagued with breakdowns that some customers have told the board it’s no longer reliable. Rouse’s full story is well worth the read. She charts familiar ground in rehashing the problems surrounding the agency’s preparation and response to Sandy, but she delves into the internal state politics of New Jersey Transit as well. The battles between Simpson and Weinstein seem to have been a deciding factor as well. From Rouse’s story, it doesn’t sound as though Weinstein’s ouster will change much at New Jersey Transit. It may improve morale on a day-to-day basis, but if Trenton is going to insert itself into every major decision, the person heading up the agency doesn’t have nearly enough autonomy to affect real change. Still, such a move shows that someone is watching, albeit symbolically. New Jersey Transit needed a change, and this may be a good first step. I’m not holding my breath for the improvements the railroad needs though. A week ago, at this very hour, tens of thousands of football fans were awaiting relief. They were jam-packed outside of Met Life Stadium, hoping that some New Jersey Transit train would show up to bring them to Secaucus Junction where they could wait for another train to get them to Penn Station. Despite New Jersey Transit’s later proclamation of a great night, it was a mess, and both New Jersey lawmakers and the National Football League have vowed to conduct investigations into the situation. One source told the Daily News that in order to have staff available, drivers were called in on overtime and NJ Transit canceled vacation days for some workers. Yet despite the planning, no one ordered the rollout of what could have been a solution to the embarrassing postgame mass transit mess. The fleet of buses was viewed merely as a contingency plan in case problems arose at the Secaucus station, sources said. NJ Transit did send about 20 buses to the stadium from a nearby highway rest area, and they arrived not long after the game ended. I don’t have too much to add here. Snarky comments don’t do this justice. It is, rather, yet another example of New Jersey Transit’s inability to operate a transit system into and out of some of the most densely populated areas of the country and some of the areas that most rely upon transit. Rolling out the buses wouldn’t have solved the problem for all 29,000 people, but such a measure would have been a no-brainer to attempt to tackle the problem. Ultimately, still, everyone at New Jersey Transit who was employed before the Super Bowl still has his or her job just like all of those upper-level executives were completely botched the agency’s response to Sandy still have their jobs. There is no accountability at New Jersey Transit, and this carelessness seems to run all the way up to Trenton where Gov. Chris Christie said he was “really proud of the work” New Jersey Transit did during the Super Bowl. As hard as it is to believe sometimes, New Jersey Transit is a vital part of the network that ensures congestion in New York City and its environs is kept to a minimum. It deserves better than this. In all of the promotional materials leading up to the Super Bowl, mass transit played a key role. The build-up to the game, much to the chagrin of New Jersey politicians, focused around New York City, but the anti-climactic Super Bowl happened out in the swamps of Jersey. So for weeks on end, organizers urged patrons to take the train to the game as parking would be limited and traffic bad. Little did anyone realize that everyone who took the train to the game would also have to take the train home from the game. For New Jersey Transit, Sunday night’s debacle in which hordes of football fans waited in close confines outside the Meadowlands train station for up to three hours after the game ended was just another in a long list of problems. This is, after all, the same agency that ignored weather forecasts and moved trains into low-lying, flood-prone areas ahead of the region’s worst hurricane in decades. No one has been held responsible for that mess, and the same people were in charge for last night’s mess. So here’s what happened: The Super Bowl organizers offered a $51 bus from Met Life Stadium into the city, but those tickets did not sell as briskly as planned. Instead, people who didn’t want to pay for parking or suffer the hassles of driving to the stadium took the train. As per usual, the ride on the way out was crowded, especially at Secaucus Junction, but tolerable. After the game, all hell broke loose. Few fans who paid for the experience of seeing a Super Bowl left early, and so when 30,000 fans headed to the train shortly after the Seahawks won, it was a giant mess. That crowds piled up long after the game ended isn’t a surprise to anyone who’s tried to take the train home from a concert. New Jersey Transit stresses the convenience of travel to the games, but in nearly five years, they haven’t been able to move crowds away from the stadium when events let out. My first experience came during a Springsteen show in 2009 when we had to wait nearly an hour just to get a train that would take us to Secaucus. Since transfers aren’t timed properly, we had to wait until 40 minutes before a Penn Station-bound train arrived. I haven’t taken NJ Transit to Met Life again. Hours after the drama unfolded, New Jersey Transit’s Twitter account seemed oblivious to controversy, and it’s stunning to hear Weinstein say they don’t know what they’d do differently. The Meadowlands stop is a dead-end stub that sees service only during peak events and can’t seem to handle post-event loads. It cost over $200 million to build, and somehow, moving out 33,000 fans over the course of three hours is a victory. The decision to kill the ARC Tunnel wouldn’t have solved Sunday’s problems but could have addressed capacity issues on a line that can’t do what it’s designed to do. And somehow, New Jersey Transit thinks this is all one big victory. That’s pathetic. Even picking on Weinstein, the teflon man behind the response to Sandy, may be a moot point soon. New Jersey Gov. Chris Christie may soon remove Weinstein from his spot, and if the embattled governor doesn’t act on his own, other Garden State politicians and columnists are starting to make more noise that should lead to Weinstein’s ouster. Even the NFL, notorious for exercising tight control over every element of the Super Bowl, wants to conduct its own investigation. This wasn’t the “world class transit experience” Weinstein promised fans a few months ago. This was instead business as usual for New Jersey Transit. Anyone who has to rely on that agency’s trains would have expected nothing more, and the New York/New Jersey region pays the price for this service on a regular basis. 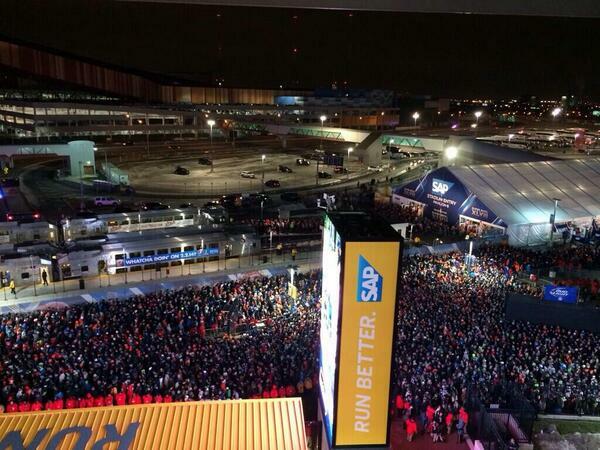 Much like New Jersey Transit apparently did after the Super Bowl, I’m taking tonight off due to hosting duties. I’ll be back in the morning with a post on the potential fare hikes that may await us in the event the MTA cannot realize its dreams of net-zero wage increase. It ain’t pretty. Meanwhile, mull on the fact that at nearly 1 a.m., there are still football fans trying to get a New Jersey Transit train from the Meadowlands to Seacuacus. The last trains of the night to various areas are leaving soon, and the so-called mass transit Super Bowl has highlighted the limitations of the areas transit network. This is embarrassing and should be a wake-up call. It probably won’t be though. New Jersey Transit’s response to Sandy is the story that just won’t die. It’s not quite a scandal, even though perhaps it should be, but the developments continue to trickle out thanks to reporting by Karen Rouse from The Record and Andrea Bernstein from WNYC. This should be a bigger black eye on the face of the Garden State and its governor, but so far, the scandal just won’t stick. [Gov.] Christie said that in the chaos of Sandy’s approach, a low-level manager who was in charge of securing hundreds of pieces of equipment at the last minute ditched a plan that was in place to protect the equipment, all without the knowledge of Executive Director Jim Weinstein. Christie claimed that the unnamed employee was a civil servant and because of civil service rules, could only be demoted. However, several officials close to NJ Transit said none of the agency’s employees fall under civil service rules, and that the law that created NJ Transit in 1979 excludes the agency from the civil service system. The day before Superstorm Sandy made landfall in New Jersey, more than a dozen NJ Transit workers — from yardmasters to the top executive — shared emails describing where and how the agency’s rail fleet was being moved to shelter it from the storm. In one of the most questionable decisions made during the storm, many locomotives and passenger cars were parked in low-lying areas in Hoboken and Kearny — a key move that caused more than $120 million in damage after the storm surge flooded the rail yards with brackish water. How this occurred remains a mystery, particularly as damage was minimal to the operations of the Metropolitan Transportation Authority across the Hudson River in New York State, which faced the same devastating storm but managed to move its fleet to higher ground. This week, at a meeting with The Record’s editorial board, Governor Christie said the decision at NJ Transit was made by one employee who didn’t follow the agency’s plan and didn’t inform his supervisors about his actions. NJ Transit officials declined to elaborate on that remark Friday, leaving open the question of how a single low-level manager could be responsible for a decision that led to so much destruction. But a review of emails obtained through a public records request shows that in contrast to Christie’s remarks, at least 15 agency executives and managers, were aware of fleet movements into low-lying areas in the days leading up to Sandy. Included in at least one email, was NJ Transit Executive Director James Weinstein — whom Christie has held blameless for the damage and whom the governor praised enthusiastically during the editorial board meeting. Unknown is whether other directives went out that were not recorded in emails and that contributed to the decision to park the rail stock in Hoboken and Kearny. But the email chains establish that information on rail fleet movements was shared widely by top decision makers at the agency. Based on Rouse’s reporting, Christie’s comments don’t pass the smell test. Lawson’s emails made their ways to Weinstein with time left to change the plan, and yet, the rail cars were left to flood. Even a minor demotion is hardly an adequate response to the magnitude of the miscalculation, and a dismissal — which could have happened — didn’t. But all of this is proverbial water under the bridge. Someone should be held responsible, but as the one-year anniversary of the storm approaches, it’s likely that no one will be called to answer for the damage. Rather, New Jersey Transit should be working to ensure every single one of its riders that these mistakes will not happen again. Instead of issuing a mea culpa and moving forward, as the MTA did after Irene, New Jersey Transit has played defense. I can’t imagine they’ll leave rail cars to flood again, but month after month of ducking and dodging has done little to instill much confidence in me. During Sandy, New Jersey Transit saw damage to nearly 350 rail cars, and the agency has vowed to remove trains from vulnerable areas, including the Meadows Maintenance Complex, if forecasts dictate. As of last week, 46 of the 70 locomotives and 141 of the 272 rail cars had been repaired and placed back in service. By identifying new storage facilities that are on higher ground, New Jersey Transit is hoping to keep its rail cars both protected and available. Numerous car sets were stranded after Irene when storage areas were cut off by flooding and track wash-outs, and Sandy swamped other storage yards. The agency can’t store trains along the right-of-way due to concerns over downed trees. Perhaps the next discussion should focus around clearing trees from the ROWs. A few weeks ago, I had the chance to take the Acela from New York to Boston, and after years of hearing about Amtrak’s terrible WiFi service, I was pleasantly surprised by the Internet connection. I could stream audio for the entire duration of the trip and saw my connection drop just once. Were I trying to do productive work that required web access, Amtrak’s service was more than sufficient. More recently, I had the chance to compare Amtrak’s service with the cell signal available on Metro-North’s Hudson Line up to Beacon. It was abysmal. Despite the dramatic views of the river, I could barely get my phone to send text messages, let alone load web-based services. For anyone trying to be productive, the Hudson Line seems out of time and out of place, and I’ve run into similar problems along the Northeast Corridor route through New Jersey. The city’s underground subway stations, as we know, are slowly becoming WiFi equipped. I’ve long been a believer that reliable WiFi can be a big driver of transit adoption. If daily commuters have the opportunity to be online and can hammer out an extra hour’s worth of work during their ride, such access can incentivize them to leave the car at home and hop on the train instead. Amtrak’s service is a good first step, and Metro-North has been threatening to equip their cars with wireless access as well. Now, New Jersey Transit is set to leap-frog them. Earlier this week, the NJ Transit Board of Directors announced a public-private partnership with Cablevision to provide high-speed wireless internet access at stations and onboard trains. Cablevision will make this network available to NJ Transit riders via a dedicated, trackside Wi-Fi network, and the two companies say this is a first-in-the-nation arrangement. “Through customer forums and surveys conducted as part of NJ Transit’s Scorecard initiative, we know that wireless internet service will be a welcome amenity for NJ Transit customers, enabling those who wish to remain connected during their commute to do so continuously,” New Jersey’s Transportation Commissioner and NJT Board Chairman James Simpson said in a statement. Cablevision will shoulder the capital costs of installing new fiber-optics and getting the network up and running. The cable provider will also run the service for 20 years, and the parties believe a full system roll-out will be completed by the end of 2016. The initial phase will involve bringing service to Newark Penn Station, Secaucus Junction and Hoboken Terminal, three of the more heavily-used stations in the Garden State. Stations and rail cars will follow. While Amtrak’s offerings and the subway’s new system are provided free of charge, according to other reports, only Cablevision customers will avoid a fee. Others will have to pony up if they want to surf while riding the rails. Still, for a modest fee, a reliable connection is well worth it for those seeking out the Internet.